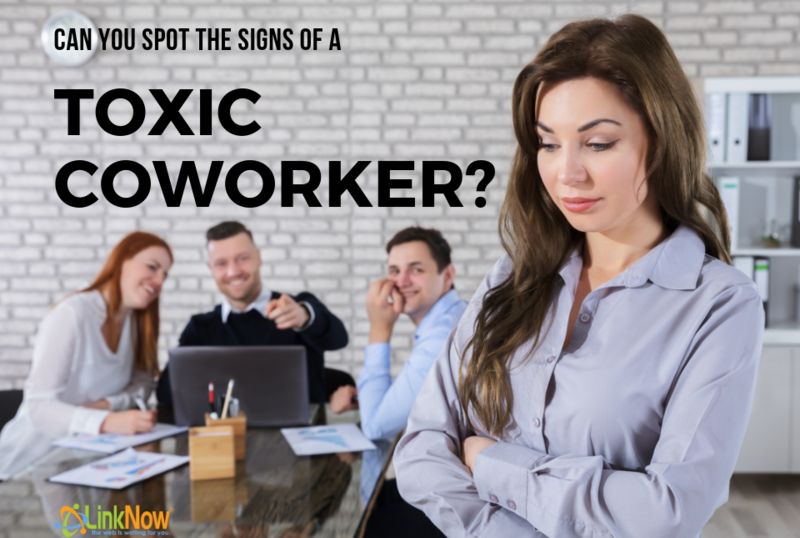 Signs You Have a Toxic Coworker ‹ LinkNow Media | We're Hiring! Sometimes we get lucky in the workplace and find happy and healthy people to build positive relationships with. These people can be lifelines during those hectic workdays and long overtime shifts. They can encourage your strengths, clarify your sharpest instincts, and make your day brighter. There can be relationships that even extend beyond the bounds of the office. Best friends always appear when you least expect them to. Finding harmony at work is a blessing. Unfortunately, there are those coworkers who feel less like a blessing and more like a… well, you know what we mean. You might be thinking of one particular coworker who rubs you the wrong way. You might not even have anyone in mind, but you surely know there is someone or something affecting your environment and mood at work. Sometimes it can be hard to notice if someone’s affecting your happiness. Toxic coworkers are rarely disruptive in the classroom sense. Instead of interrupting teachers or bullying other classmates with name-calling, they gossip or express only negative opinions. Do you have an employer or colleague who contributes to a toxic work environment? Here are the telltale signs of a toxic coworker courtesy of LinkNow Media. Experiencing toxic behavior and abuses of power is common in the workplace, but few of us are able to identify it as such. That’s because only recently have workplaces become more proactive in dealing with toxic behaviors. At LinkNow Media, we really believe in fostering a happy and harmonious workplace. That means actively practicing proper conflict resolution strategies, and fostering an environment where employees feel comfortable forcing their concerns. Is there someone in your office who never stops gossiping? Are they constantly sharing the details of other people’s secrets or their private lives? These habits might seem harmless but think about how it makes you feel throughout the day. Do you feel uncomfortable speaking openly with this person? Are you worried they’re gossiping about you? Such feelings do little to foster a healthy work environment. How would your coworkers feel if they found out about this person’s love for gossip? Gossips love getting a hold of juicy information and wielding it with power. Is there someone in your office who never ceases to criticize and dismiss other people’s bright ideas? People don’t notice how stifling such behavior is at first. They might feel tense and uncomfortable, but they’re not sure why. Until the behavior finally stops, that is. When the criticism and bullying ends, that’s when people finally free comfortable to speak freely and brainstorm with their colleagues. These negative qualities along with many others can really turn a workspace upside down. When colleagues and administrative staff are trained in how to identify and manage toxic coworkers, however, things can run more smoothly. And that’s how we like to handle things at LinkNow Media.